This article is about the baseball player. For other uses, see José Abreu. This name uses Spanish naming customs: the first or paternal family name is Abreu (ah-bray'-oo) and the second or maternal family name is Correa (cor-ray'-ah). José Dariel Abreu Correa (born January 29, 1987) is a Cuban-born professional baseball first baseman for the Chicago White Sox of Major League Baseball (MLB). He played in the Cuban National Series for Cienfuegos before his defection in August 2013. After being granted free agency by MLB, Abreu signed with the White Sox in October 2013. Since 2013, Abreu has performed primarily as a first baseman, however he has also filled in at designated hitter for the White Sox. Abreu set a Cuban home run record in 2010–2011 and was named league MVP. He had played five seasons in the Cuban Serie Nacional through 2007–2008, hitting .295 and slugging .467. After 48 games in 2008–2009, he was batting .345/~.368/.600, earning the infielder a spot on Cuba's provisional roster for the 2009 World Baseball Classic. He did not make the final cut and finished the season with a .346/.441/.630 batting line. He led the 2008-09 Cuban National Series with 30 times hit by pitch. He tied Yenier Bello and Alex Guerrero for 8th in homers (19), was 8th in slugging and 4th in strikeouts (69). Abreu was 2 for 10 in the 2009 World Port Tournament, backing up Ariel Borrero at first base. In the 2009 Baseball World Cup, he hit .250/.333/.469 in his first major tournament. He was listed in the IBAF's Final Report as being one of the All-Star outfielders alongside teammate Alfredo Despaigne and Jon Weber, but other sources list Puerto Rico's Miguel Abreu, who had better statistics. He was not even used as a starter in the outfield, playing alongside Ariel Borrero at first. In the Gold Medal game, he did not appear as Borrero saw the action. In 2009–2010, Abreu had his best year yet, hitting .400/.555/.822 with 82 runs, 30 homers, 76 RBI and 74 walks to 49 strikeouts in 89 games. He tied Leonys Martín for 6th in the Serie Nacional in runs, tied for third with 25 doubles, tied Yulieski Gourriel for second in home runs (one behind Alfredo Despaigne in a to-the-wire home run race), was third with 235 total bases (behind Despaigne and Gourriel), again led with 30 times hit by pitch, tied Enrique Esteban Díaz for 4th in walks, led with 32 intentional walks (12 more than runner-up Yosvany Peraza), was second in average (.005 behind Despaigne), led in slugging (.008 over Despaigne) and probably led in OBP. He was named the All-Star first baseman. 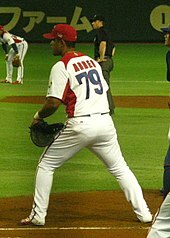 Abreu was Cuba's starting first baseman when they won the 2010 Intercontinental Cup, their first Gold in an international tournament in three years. He hit .292/.320/.500. In the finale, he went 1 for 3 and scored the first run in the victory over the Dutch national baseball team; he doubled off Rob Cordemans in the third and came home on a Yorbis Borroto hit. He helped Cuba finish second at the 2010 Pan American Games Qualifying Tournament. In the 2010 World University Baseball Championship, he posted the best average by going 10 for 18 with 2 walks, a double, triple, four homers, 9 runs and 12 RBI in six games as Cuba won the Gold. He was 0 for 4 in the finale, as Cuba edged Team USA. He was named the event's All-Star 1B. Abreu continued to improve in 2010–11 Cuban National Series with one of the greatest seasons in Cuban history. He hit .453/.597/.986 with 79 runs, 93 RBI and 33 home runs in only 66 games. Despite missing 23 games due to bursitis in his shoulder, he broke Despaigne's home run record (as did Yoenis Céspedes – both hit their 33rd on the season's last day). Despaigne would reclaim the record a year later. Abreu led the league in average (.052 over Michel Enríquez), slugging (a whopping .212 over runner-up Frederich Cepeda), intentional walks (21) and homers (tied with Yoenis Céspedes), was second in RBI (6 behind Céspedes), tied for 8th in runs with Donal Duarte, was 7th in total bases (209) and 4th in times hit by pitch (21). Had he not been injured, he would have likely easily won a Triple Crown. He won Cuban National Series Most Valuable Player Award. He was the second MVP from Cienfuegos, following Pedro José Rodríguez, Sr. by 31 years. Abreu was named to the Cuban national baseball team for the 2013 World Baseball Classic. In Cuba's six games, he batted .383 and hit three home runs while recording nine RBIs. In August 2013, Abreu defected from Cuba to test the MLB free agent market. His defection was later confirmed by former teammate Henry Urrutia. He established residency in the Dominican Republic and was named a free agent. In October, he signed a six-year contract with the Chicago White Sox worth $68 million. On the White Sox, Abreu joined fellow Cuban players Alexei Ramírez, Dayán Viciedo, and Rule 5 draft pick Adrian Nieto. Abreu recorded his first major league hit on March 31, 2014 against the Minnesota Twins. On April 8, 2014, Abreu hit the first two home runs of his career at Coors Field, helping his team defeat the Colorado Rockies 15-3. On April 25, 2014, he captured his eighth home run of the year off Chris Archer, tying the rookie record for homers in March/April. Later that night, Abreu recorded his third multi-homer game with a walk-off grand slam off Tampa Bay Rays pitcher Grant Balfour giving him nine homers in his first month in the Major Leagues, surpassing the record of eight shared by Albert Pujols (2001), Carlos Delgado (1994), and Kent Hrbek (1982). Two days later, Abreu broke the rookie record for RBI in the month of April with 31, and extended the April rookie home run record to 10. For his performance, Abreu was awarded a share of the AL Player of the Week Award with Seattle Mariners' third baseman Kyle Seager. During this week, Abreu batted .310 with 5 home runs, 14 RBI and an .862 slugging percentage . On May 18, Abreu was placed on the 15-day disabled list with tendinitis in his left ankle. On June 2, Abreu returned from the DL to face the Los Angeles Dodgers. In his second at bat after his return, Abreu hit a two-run home run off Dodgers ace Clayton Kershaw. On July 6, Abreu was selected to the 2014 MLB All-Star Game along with teammates Alexei Ramírez and Chris Sale. At the All-Star Break, Abreu had a .292 batting average with 73 RBIs and an MLB-leading 29 home runs. During the season, Abreu was named both player of the month and rookie of the month for April & July. Nobody in baseball had ever won both awards in the same month twice in one season. Having won the rookie honor in June, Abreu became only the fourth player to win the Rookie of the Month honor three or more times in a season. Abreu finished the season with a White Sox rookie record 36 home runs. He won the 2014 Sporting News American League Rookie of the Year Award. He was awarded the AL Silver Slugger Award for first basemen, becoming the only White Sox first baseman besides Frank Thomas to ever gain the honor. Abreu was unanimously named the 2014 AL Rookie of the Year by the BBWAA on November 10, 2014. 2017 was an incredible year for Abreu in which he held many of the top 20 ranks within Major League Baseball. In 2017, Abreu was 8th in the Major League's for batting average, batting .304 for the season. He additionally led the league in total bases. Abreu created a total of 116 runs throughout the season, placing him at fifth in the League. He was third in the league for triples hitting 6 over the course of the regular season, and had 82 total extra base hits, making him 82nd in the league. In 2018, Abreu again was selected to play in the 2018 All-Star Game as part of the American League team as a first baseman. After the 2018 season, he was also awarded his second Silver Slugger Award for first basemen. He batted .265/.325/.473 in 2018, each the lowest figure of his Major League Baseball career. Abreu wears #79, an unusually high uniform number. His mother, Daysi Correa, chose the number so that people would remember it. Abreu's mother and the rest of his extended family remained in Cuba until his parents moved to the United States in May 2014. Later Jose Abreu said he ate the first page of the fake Haitian passport he was traveling on before his flight landed in Miami. The 2014 MLB All-Star Game was the first game that his parents saw him play in since leaving Cuba. ^ a b Rogers, Phil (March 1, 2013). "Your Morning Phil: WBC, Thome, Sale". Chicago Tribune. Retrieved April 29, 2014. ^ a b Tom Gatto (October 17, 2013). "Jose Dariel Abreu contract: White Sox reportedly set to pay Cuban defector $68M over 6 years – MLB". Sporting News. Retrieved October 29, 2013. ^ "Reports: Slugger Jose Abreu defects". ESPN.com. August 13, 2013. Retrieved August 13, 2013. ^ Sanchez, Jesse (August 13, 2013). "Urrutia confirms defection of Cuban slugger Abreu". MLB.com. Retrieved August 13, 2013. ^ Merin, Scott (October 29, 2013). "White Sox introduce slugger Abreu to Chicago". MLB.com. Retrieved October 29, 2013. ^ "Jose Abreu sets rookie record for RBIs thru April". ESPN.com. Associated Press. April 27, 2014. Retrieved April 29, 2014. ^ "Abreu, Seager share AL Player of Week Award". MLB.com. April 28, 2014. Retrieved April 29, 2014. ^ "Jose Abreu of Chicago White Sox makes history with Player of the Month honor – ESPN Chicago". ESPN.com. Retrieved October 21, 2014. ^ "Jose Abreu establishes White Sox record on Paul Konerko Day". CSN Chicago. Archived from the original on September 23, 2015. Retrieved October 21, 2014. ^ "Abreu starts collection of rookie honors". ESPN.com. Retrieved October 21, 2014. ^ Miller, Doug (November 10, 2014). "White Sox Abreu, Mets' deGrom named Rookies of Year". MLB.com. Retrieved November 10, 2014. ^ a b c Hartwell, Darren (July 15, 2014). "Jose Abreu's Parents To Watch Son Play For First Time In U.S. At All-Star Game". nesn.com. Retrieved July 15, 2014. ^ David Haugh, Jose Abreu traveled a long way to join White Sox, Chicago Tribune, Published 25 January 2014, Accessed 6 May 2014. ^ Paula McMahon, Published 2 March 2017, White Sox's Jose Abreu says he ate fake passport, washed it down with beer on plane to U.S.
Wikimedia Commons has media related to José Abreu (baseball). Some or all content from this article is licensed under the GNU Free Documentation License. It uses material from the BR Bullpen article "José Dariel Abreu". This page was last edited on 25 April 2019, at 16:26 (UTC).